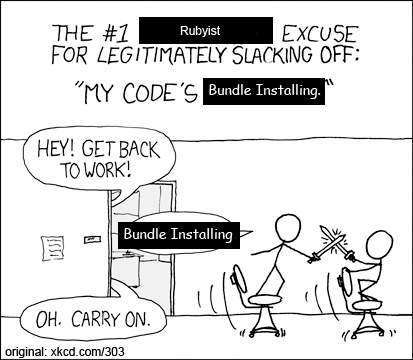 Do you realize how much time you’ve spent running bundle install? No more sword fighting! Bundler 1.4.0 adds support for parallel installation. You can pass in --jobs SIZE as a parameter to bundle config1. I recommend setting the size to one less the number of CPU cores on your machine2. Let’s benchmark this! I’m going to run bundle install on a freshly-created Rails app. That’s about 19 seconds faster (~61.90% improvement) over regular bundle install!!! And now, you can spend less time on sword fighting3, and more time on writing actual code. I would like to give my thanks to Kohei Suzuki who submitted this patch to Bundler and Murahashi Kenichi for bringing this into my attention on Appraisal.